Learn more about how Skytap Cloud can be used to modernize your traditional applications without a complete rewrite. Our IPA approach to modernization enables you to modernize your infrastructure, processes and architecture at your pace to successfully meet your business needs. Migrating applications to the cloud is a top priority for Enterprises, but they are grappling with how to address BOTH developing new cloud native applications AND modernizing traditional applications that were never imagined to run in the cloud. To address this challenge organizations must look beyond the hyperscale cloud providers and a one-size fits all approach and lean into multicloud. Join us for a discussion about how you can make multicloud work for you and accelerate the modernization of your existing app portfolio with featured speaker Dave Bartoletti, VP & Principal Analyst at Forrester Research. Dave leads Forrester’s cloud computing playbook team. Transform what’s possible in just 30 minutes. Most of your core applications weren’t built for the cloud era. But they could do even more for your business if they made the leap. The question is: How? Skytap’s cloud experts can help you migrate core workloads into a modern IT portfolio and build a true ‘always on’ business. Unlock the full innovation potential of your core applications in just days – with truly unique Skytap insight. Skytap Cloud accelerates enterprise innovation by modernizing traditional applications with cloud-native development and services. 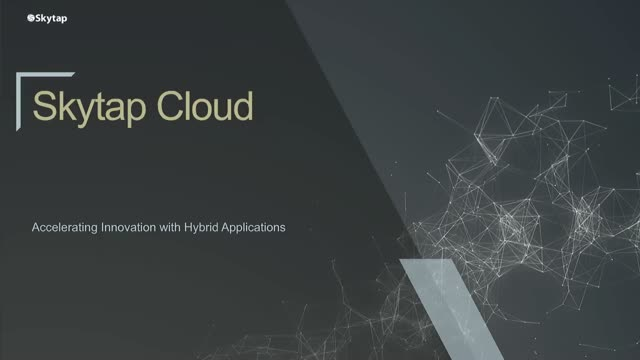 Our technology makes it easy to build, run, and evolve these hybrid applications by rapidly migrating traditional workloads to the cloud, enabling modern development practices, and integrating new cloud architectures and processes.